Trainee in "Emmetts Demolition Crew"
Hey Melody!! I'm glad you're comfy here!!!!!!! Carrie~ Uhm, you put both Hannah and Willow. So am I a Jackhammer Operator or Trainee? Yola Ted, Fat, Paige, Carrie, Jenn, Elise, and Bri! Welcome to Kay and Mel, whose posts I could not find. Sorry. I'm Hannah or Hanny, and welcome to the EDC! Speaking of, when we were in a mall in the US like a month ago, there were sections, and on the directory there was a floor whose sections were E, D, and C. I took a picture of it. to Fat's response~ I agree about that. I think he'd be more honest and hardworking, since he couldn't just sit back and let Alice see all the stock market, etc, but he'd have to work, and work lots. he'd still be charming, funny, big, and strong, like you said. and the whole reason I replied to you, is because I thought you said he'd be MORE, then half-way through realized you said less. hehe. sorry. Hey Everyone I'm back! Those who know where I was at the Aerosmith Concert was AMAZING! Steven Tyler (the lead singer) is awesome! The Drummer and the Guitarist both had solos! which was awesome! and of course Steven is the best! The only bad thing I have to say is all of the drunk idiots by us cause we were on the floor of the stadium the 17th row from the stage so we were really close but there was a lot of drunk people! They spilled Beer all over my shoes! otherwise the concert was AMAZING! Bri: My friend that went with us to the concert smuggled a camera in( ) and she took pics and videos so I'll try to get those on here! Hannah: You were talking about the EDC directory sign thing and I just had to say that when we went out to eat we were on Emmett street! Kinda silly to over react to but I was soooo happy. Congrats to everyone that got PROMOTED! Good job! Fat: Hi! I'm back now and don't plan on dissapearing anytime soon! ummmmmmmmm I don't think he would ever be truly happy because him being changed and meeting Rose was fate but I think he would live a normal life maybe be a engineer (don't ask why) or something and maybe get married to some girl in a small town and have kids. Haha good answers you guys!!! Hanny ~ Oh, silly sister of mine Omigosh, that's so cool, you should put that picture on FB!!! We seem to be running out of questions fast... That's awesome!!! What do you think Emmett's parents were like? Paige I'm on the ListV2! Hannah/Willow- I'm so stupid! Sorry about that. I put your name down when I was counting it all up as Hannah, and then later as Willow. Anyway, you are a Jackhammer OPERATOR. Yay for you! Another promo! See, I told you that some of you guys were really close. Congrats to Fat who is now a Dump Truck Trainee! And now for a question! We know Emmett as the prankster/jokester. How do you think he would be as a father? Would he still be the same, or would he become somewhat like Edward? I think he'd become a mixture of both. Or, maybe the way to put it would be to say that his protective side would just become a bit more noticable. He'd definitely have his fun, but there would be absolutely NOBODY so much as touching that kid. Wow. That was short and to the point. Oh well! -Bounces in- Hi, hi everyone! And thanks for the welcome back, Fat. 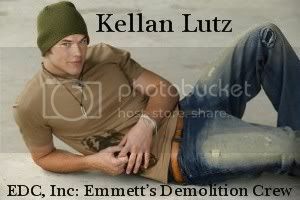 ^_^ Kellan was HILARIOUS in Stick In. Me and my dad were just watching it again the other day. The scene of him wearing make-up with the hair-ties in his hair will never get old. Didn't someone on here make an icon out of that part in one of the earlier threads? Congrats on being able to vote, Elise! Even if it isn't that interesting, at least it's something, right? CARRIE! -Glomps- Isn't it weird how the thread suddenly exploded? But I'm loving it, I haven't talked to most of you in SO long so this is de-wait for it... Lightful! Delightful! Sorry, I was just watching that episode of How I Met Your Mother the other day and I couldn't resist. Hmm, I think he would gone on living his life like a normal person. He would have taken care of his family for as long as he could, then get married, have a big family of his own, etc. Just a pretty normal life. And I don't live in farm country but I've always been able to see him working on a farm too, Hannah. But I think I've mentioned that on her umpteen times. He just seems like the really hard-working type to me. Oh man, can you imagine Emmett with a daughter who wants to date? I AM SO EXCITED TO SEE YOU AGAIN!!! It has bee waaaaayyyyyy too long!!! Congrats to all the promos!! I think his personality would've been very much the same, very carefree and loving, ready to have a good time. He would've gotten married to a beautiful lady, probably someone very similar to Rose, then had the cutest 4 kids, raised them and been the best dad in the world, grown old with his wife, watching his kids grow up and have their own kids, spoiling them with the best grandpa in history. Or at least that's what I think would happen if he never got turned. I think he would be the best father in the world. I think he would be the same, we've seen him a bit with Ness and they say he is really good with her. He would play all their games with them, even the dolls with daughters. teach them to have the best sense of humour and have a fun time, no matter the circumstances. But then I also think he could be really sensible with them and teach them all the right manners and being generally good people. He would be quite protective of them, but not to the point where they aren't able to do things they want. Just noone would touch them..
Oh and face de-swelled nicely and now I'm in the middle of the 40 hour Famine for World Vision so I'm quite the hungry little munchkin but it's all for a good cause!! Right I think I've procrastinated from Phyics enough tonight so I'll be back soon peeps!! They were probably a very close family. His mother and father would have been deeply in love and enjoyed life. I think that they wouldnt have been rich but not poor either. Maybe more near the poor end of the spectrum. His dad would have been like him in many ways - looks and humour. While his mother was probably very protective of her family and was very affectionate. Emmett would have been a fantastic father. He would love to play all of the kids games with them and i think he would spoil them silly. All of the kids would have a great sense of humor like their dad and they would really enjoy life. They would be really positive children. I dont know if he would be the exact same, maybe the loud Emmett we know but slighly quieter and toned down He wouldnt be as protective as Edward - he would want the kids to mess around and get covered in mud!